Don’t reinvent the wheel – just roll out these classic games kids still love! Use the download links below to keep a printed copy on hand in your teaching space. Some lessons have a related game, which is ideal. Often you just have to improvise your own games. Don’t call it wasted time if the kids are making friends and learning to work together. Remember having a positive experience (aka fun) is one of the things kids need every Sunday. Oftentimes we look for newest, next greatest, most innovative thing to do with the kids. There is no harm in that, but sometimes the classics can be just as fun and just as fruitful. Keep this list with you, just in case you need a quick game to play. Most of you probably know how to play these games, but I’ve included a brief description just in case. Here are nine classic group games you can play with kids in your children’s ministry. I am constantly amazed at how much kids seem to like these games even into later elementary years. Have the kids form a circle sitting on the floor. One child walks around the circle tapping each child on the head and reciting the work “Duck” as they do so. When they tap the child they wish to select, they say/yell “Goose.” That child then has to get up and chase the child who selected them (the “tapper”) around the circle. The tapper tries to get back to the spot vacated by the Goose before the Goose catches and tags them. The Goose becomes the tapper for the second round. Have the kids stand in a circle. Select one, or a small group of kids, to be in the middle of the circle. The kids on the outside throw a ball to other kids in the circle trying to keep the kid(s) in the middle from intercepting the ball. If a child in the middle of the circle does get the ball, they trade places with whoever threw the ball. Have the kids stand/sit in a circle. They pass/throw an object (with a large enough group you can use more than one) around the circle as music plays. Whoever has the object when the music stops is out. There are many versions of dodge ball. Here is a great one for more confined spaces. Have the kids line up in a large circle. Designate a small circle/square inside. Put one group of kids in that area. Kids in the outer circle try to throw the balls (I advice you use foam balls or even beach balls) at the kids in the inner circle/square. Once a child is hit, they have to leave the game. Hits to the head to do not count. Once the first inside group is eliminated (or at set time intervals) put a new group of kids in the center circle. This is a simple and fun game. Have the kids line up single file. The leader (first kid in line) make outrageous motions, etc. as he walks around the room. The kids behind must follow the lead of the person in front. For a competitive game, set up two lines and take players out as you notice them not following the leader. I am always amazed by how even older elementary aged kids love this simple game. This one requires a little more preparation because you’ll need one of those cloth multi-colored parachutes and some balls. Just have the kids circle around the parachute, throw the balls in, and you can have all kinds of fun. Have them try to keep multiple balls airborne. Try to hit the ceiling. Try to have the kids roll the balls off one side of the parachute. The possibilities are endless. Set up a number of chairs less than the number of kids playing (For small groups use one less chair. For larger groups you might want to consider two or three less chairs). As you play music, the kids walk around the chairs. When the music stops, the kids scramble to find an empty seat and sit down. Any child left standing is out. Remove another set of chairs and start the second round with the remaining players until only one seat is left. Need More Ideas? Browse all our Sunday School Games or just look at the ones that work well as children’s church games. 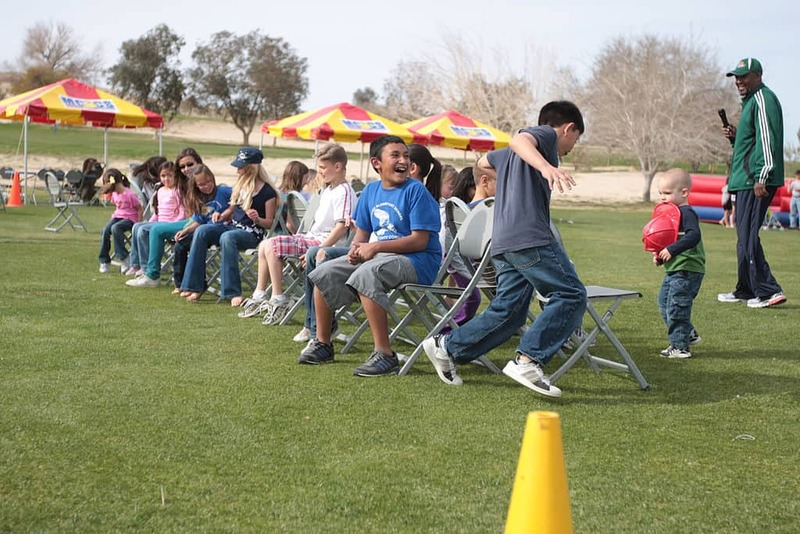 You can also try some fun AWANA games for high energy options. Tony Kummer (Editor) reviewed & updated this page on : March 15, 2019 at 5:56 pm. All our content is peer reviewed by our readers, simply leave a comment on any post suggest an update.